known for its sprayed-on truck bed liners, announced today their year-end coupon – 20% off of all sprayed on applications. This coupon is available to all consumers, and will be honored at participating Rhino Linings dealerships within the United States and Canada. Rhino Linings is dedicated to continued engagement with its consumers. This promotion is intended to capture potential new prospects for the holiday season. 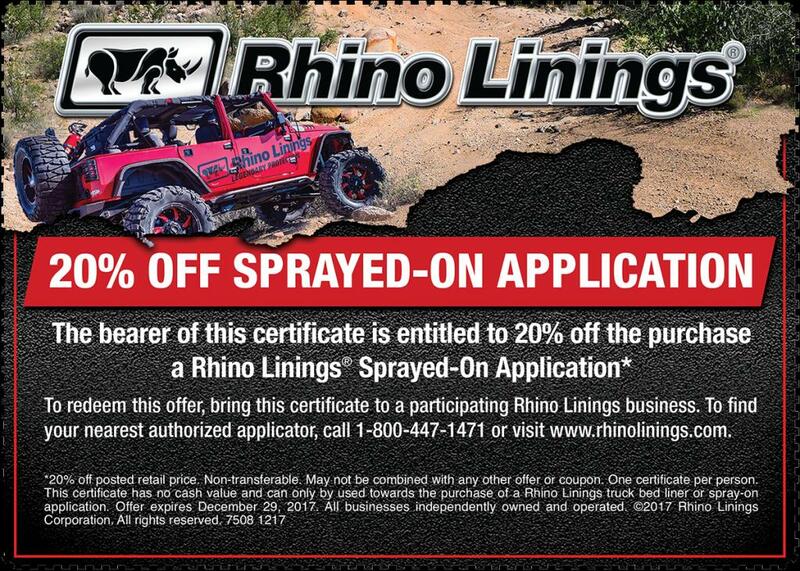 “For almost 30 years, Rhino Linings has proved to be the trusted sprayed on bedliner, and we’d like to offer a token of gratitude to our fans – a coupon, so that everyone can ‘put a Rhino’ under their tree. Our sprayed on applications can be used on trucks, Jeeps, ATVS, cars or accessories,” said Pierre Gagnon, president and CEO of Rhino Linings Corporation. To obtain the discount, the coupon needs to be printed and brought to a participating Rhino Linings dealer within the United States and Canada, and is open to US and Canadian residents 18 years of age or older. The promotion ends December 29, 2017. For more information, please visit http://rhinolinings.com/news/press-releases/2017/rhino-linings-year-end-promotion.